Have you been told that you just don’t have enough bone on your upper arch that can support implant teeth? Have you been advised that in order to have implants placed on your upper arch that a bone graft and or a sinus lift would need to be the first step towards placing implants? If these questions sound familiar, then please read on to see what Dr. Velinsky can do for you by bypassing these costly, additional procedures and getting you fixed implant supported teeth in about one hour. Avoiding bone grafts is Dr. Velinsky’s expertise with the Teeth-in-an HourTM concept. Dr. Velinsky has had several patients who have been told they needed to have upper jaw bone grafting and sinus lift surgery done first before having any implants placed. These procedures are additional, and may cause delay in treatment due to healing time needed before any implant and teeth can be placed. One of our patients was just two weeks away from having multiple hospital surgeries where hip bone was going to be grafted into the patient’s upper jaw, then left to heal for a period of one year, before any implants would be placed. In addition to having this form of surgery, no denture could be worn for 4-6 months during that time. This patient had been told about Dr. Velinsky, gave us a call and is now eating and smiling with the Teeth-in-an-HourTM procedure. The patient was extremely satisfied without having to go through the multiple surgeries and 1-2 years of healing time it would have taken to finally obtain the same result. How is this possible? With the aid of the CT-imaging, Dr. Velinsky and his surgical team is able to locate other landmark areas within the patient’s mouth that have adequate bone to support specialized, elongated implants for these areas. These special, elongated implants are named Pterygoid and Zygoma for the specific locations in the mouth where they are to be placed. Pterygoid implants are placed in the back of the upper arch where there almost always is an area of bone present. 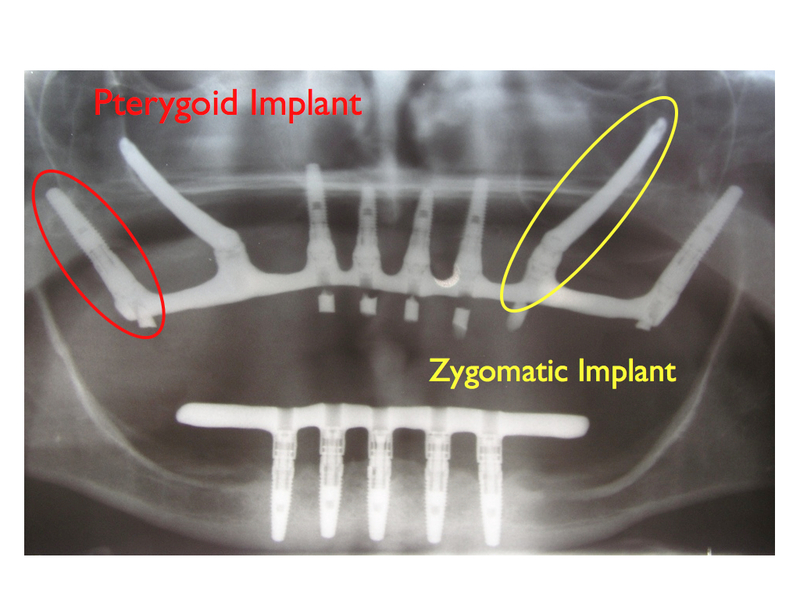 Zygoma implants are longer and are placed in areas of permanent bone in the cheekbone area. What does all this mean for you? All the preparation work is completed prior to you coming in on the day of the procedure. Dr. Velinsky and his team of Oral Surgeons have already completed a virtual surgery of your mouth with the aid of the CT scan. From this virtual surgery, they will have made a custom fitted guide for your mouth that allows them to place the specialized implants exactly where they want them, as well as placing the custom designed teeth to place on top. Dr. Velinsky and his team of oral surgeons have studied extensively in regards to placing and restoring zygomatic implants. They were the first on the Treasure Coast to perform these procedures and have extensive training and experience for this procedure.